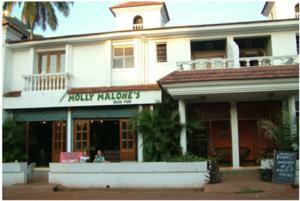 Leslies Molly Malone's is a 10-minute walk from Calangute Beach and a 15-minute drive from the popular Anjuna Flea Market. It features an Irish pub and offers free parking on site. Air-conditioned guest rooms are fitted with a safety deposit box and a cable TV. The en suite bathroom comes with toiletries and shower facilities. Guests can make travel arrangements at the tour desk. Laundry services are available. Leslies Molly Malone Irish Pub serves an English breakfast and a selection of Irish dishes. Featuring an Irish setting, guests can enjoy alcoholic drinks and mocktails there as well. The hotel is a 30-minute drive from Thivim Railway Station and a 1-hour drive from Goa Dabolim Airport. Free! All children under 8 years stay free of charge when using existing beds. One older child or adult is charged INR 500 per night and person in an extra bed. Maximum capacity of extra beds in a room is 1. There is no capacity for cots in the room. Any type of extra bed or child's cot/crib is upon request and needs to be confirmed by the hotel. Supplements will not be calculated automatically in the total costs and have to be paid separately in the hotel.